4" x 4" x 4" cube vase. This item features a high gloss mirror finish. 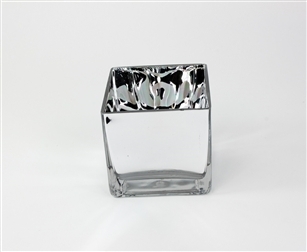 We bought a large order of these for our wedding centerpieces for the dining tables and they are great! The mirror effect is subtle but you can't see through the glass which is what we wanted- there are some bubbles and things throughout the glass but you wont be able to tell when they have flowers in them. Love them! Minor flaws. Close enough to what I wanted. Price was right, can't complain.